Another peculiarity of this plug-in is that the threshold is not fixed, but relative to the signal, the compressor is driven by the sum of the filters which is computed against the unfiltered signal, this difference is then used as key for the compressor. What happens with this kind of processing is that de-essing takes places even in softer passages where with traditional fixed threshold de-essers the signal must be above the set threshold for de-essing to take place. The heart of the plugin is the filters bank, here you can set the frequency and level of each filter individually, the bandwidth will always be 1KHz for each filter. For fine tuning you can listen to the output of the filter bank or each filter individually using the key listen buttons. Each filter can be turned on and off, when turned off the filter is disabled and won’t be considered as compressor sidechain. Sybilla Pro offers two compression flavors, VCA and OPTO, the first is snappier and has a hard knee, while the second is slower with a soft knee, for each of the modes attack and release can be set. This one sounds very dull to me. Personally I am not able to find a right setting for anything, be at a human voice or hi-hat or anything else. The concept and interface of Sybilla Pro are so flexible, practical and powerful ! I can always get the best result without even touching the knob of wet & dry though it can smooth out the outcome for sure. There are eight bands provided to adjust, however I usually use only 3-4 of them to fulfill my target easily. It won't hurt the high frequencies to make the sound so boring like the others. Sybilla Pro is the best de-esser plugin I've ever used. Without it, I'd rather edit manually . The best voice De-Esser i've heard. This must be by far the smartest de-esser I have tried. I have a singer who really whistles his esses and I couldn't find a tool to control him without losing all highs and making his voice dull. I tried the demo of both Sybilla and Sybilla Pro. They both worked better than anything else I've tried. So I purchased the Pro version to have more control. Very reasonably priced and a really professional and smartly designed tool. Thank you very much! 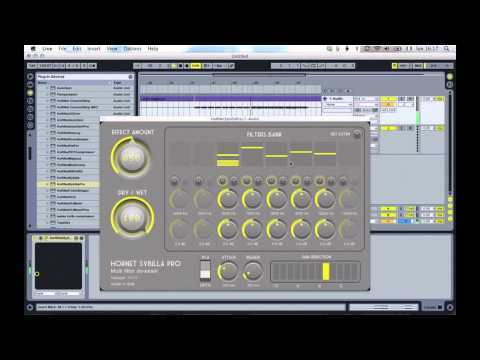 This is my third Hornet plugin and I'm sure I'll purchase more in the future! Excellent de-esser! Smooth, precise, unobtrusive. Opto mode is a welcome creative tool. Thank you HoRNet! This is the only de-esser for such a good price that could compare fabfilter ds.